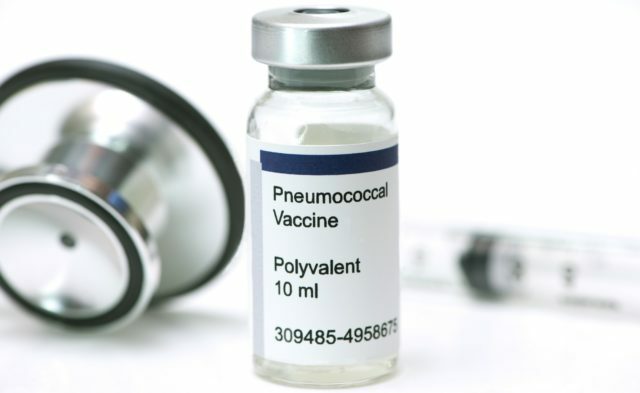 Investigators report that the pneumococcal H influenzae protein D conjugate vaccine remarkably reduced disease burden due to pneumonia in infants and young children. The burden of childhood and infant pneumonia can be effectively reduced through the use of the pneumococcal Haemophilus influenzae protein D conjugate vaccine, according to a study published in Vaccine. The study included 47,366 infants age < 18 months. Those age < 7 months by the initial vaccination received vaccines in either a 3+1 or 2+1 routine, whereas those between 7 and 11 months were given 2+1, and all older children were given 2 doses. The control group was given hepatitis vaccines in 26 clusters, while the treatment group received pneumococcal H influenzae protein D conjugate vaccine in 52 clusters. For participants in the treatment arm, vaccine effectiveness was 27% for children age < 7 months (95% CI, 14%-38%; rate reduction=3.4/1000 person-years), 32% for those age 7 to 11 months (95% CI, 3%-52%; rate reduction=4.7/1000 person-years), and 23% for those age 12 to 18 months (95% CI, –5%-44%; rate reduction=2.5 per 1000 person-years). For pneumonia with alveolar consolidation or for pleural effusion, the estimates of vaccine effectiveness were 45% (95% CI, 26%-60%) for participants aged less than 7 months, 56% (95% CI, 14%-77%) for those age 7 to 11 months, and 48% (95% CI, 2%-73%) for children age 12 to 18 months. The study was geographically stratified into 72 different clusters, which were subject to adjustments for birth cohort size and healthcare provision regions. The National Care Register was used to identify hospital visits matched with pneumonia-compatible ICD-10 codes, and each event was coupled with 1 to 3 chest X-rays. Radiologists interpreting the images were blinded from the vaccination status of the patient. The primary diagnosis was pneumonia diagnosed and treated in the hospital, with others including pneumonia confirmed by a radiologist in the follow-up period. Total vaccine effectiveness was calculated separately for each cohort. This study was funded by GlaxoSmithKline Pharmaceuticals. See the reference for a full list of disclosures.